Anyone who loves to drink and has a penchant for creating things is bound to try brewing their own batch of alcohol. Not only do you learn a lot about the process and the ingredients used to create a product, but you can also form a hobby and/or a living out of it. It can become a passion of yours to perfect the flavor of your brew, or start selling it in small batches to friends and family. Whichever alcohol you decide to try concocting, one thing's for sure - not all alcoholic beverages are created the same way. Some take longer processes (to a year) and require more equipment, while others just need you to pop it in a bottle and let it ferment with yeast. One alcoholic drink that takes premium ingredients, skill, the right materials and setting to properly produce is sake. Known internationally as the spirit that truly represents Japan, sake is both simple and complex. Simple in the sense that it is easy to make in its bare bones, but complex enough for its final product to react greatly to small tweaks in details when it comes to its brewing procedure. Before diving right into how to make sake yourself, it is crucial to first understand the basics of sake. Sake is the product of polished rice that has been fermented in water with the use of a special kind of mold called “koji”. Contrary to what everyone often calls it - which is “Rice Wine”, Sake cannot technically be categorized as wine. Wine is made when the sugars in a fruit ferment to form alcohol directly. Beer, on the other hand, needs its starch to first turn into sugar before the sugar turns into alcohol. 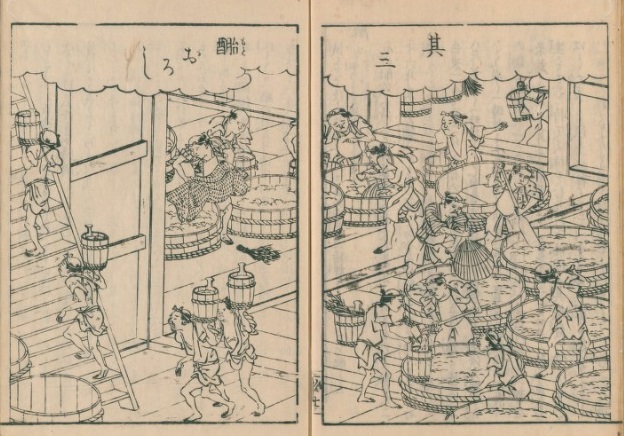 The process of fermentation in sake is akin to beer, with one crucial difference. In beer, the process happens into distinct steps; from starch to sugar, and then sugar to alcohol. In sake, however, those two distinct steps happen simultaneously. The sugar made from the starch turns into alcohol at the same time that remaining starch is turning into sugar. This is called parallel fermentation. Also, wine, beer, and sake all have different ABV (alcohol by volume) percentages. Beer ranges from 3% to 9%, wine can go from 9% to 16%, while sake (without any added water) hits 18% to 20%. In most commercial bottles of sake, water has already been added, diluting the ABV to around 15%. What is the Difference Between Moonshine and Sake? Sake and Moonshine are completely different alcoholic beverages. Moonshine is unaged, distilled alcohol that is made and sold without being charged taxes. It has a negative connotation to it, being stereotyped as an alcoholic drink made by those desperate to get a kick out of alcohol for cheap. Moonshine is also usually made from corn but is not restricted to just corn. Rye or sugar, for example, can also be used to make moonshine. Illegal moonshine could pose as a potential health hazard to drink it, so those who do need to understand that there is risk involved in consuming it. When it comes to the production of sake, a specific kind of rice made especially for sake is used, called “saka mai” (酒米). These grains of rice can withstand being polished more than other grains of rice and has a starchier characteristic to it that heightens the taste of sake. Next is water. The more natural and pure the source of water, the better, as distilled water will not help the fermentation process. Instead, mineral water works better to provide the yeast nutrients. First, the rice is polished, rested, washed, and steeped in water for a time that is determined by the brewmaster, or in Japanese - “toji”. The more polished the rice, the quicker the steep time. Once it is done soaking (this could take an hour to a whole day), it is laid out of a conveyor belt to be steamed. After it is done steaming (at a very controlled temperature and highly monitored temperature so the rice doesn’t burn), it is portioned in preparation for the different layers of fermentation. Next, Aspergillus oryzae is added to one partition of rice. This partition is then kept away for about a week so it ferments, forming “koji”, which is a special molded rice. After that, Saccharomyces cerevisiae or yeast culture (the fermenter) and water are added to the koji. This mixture is left at a low temperature of 4 degrees Celsius to ferment again for another week. The other partitions of steamed rice are slowly added in three separate, but timed occasions over 4 days to the koji mold. This layers the process so that the yeast is not overwhelmed by the amount of steamed rice mixed into it. 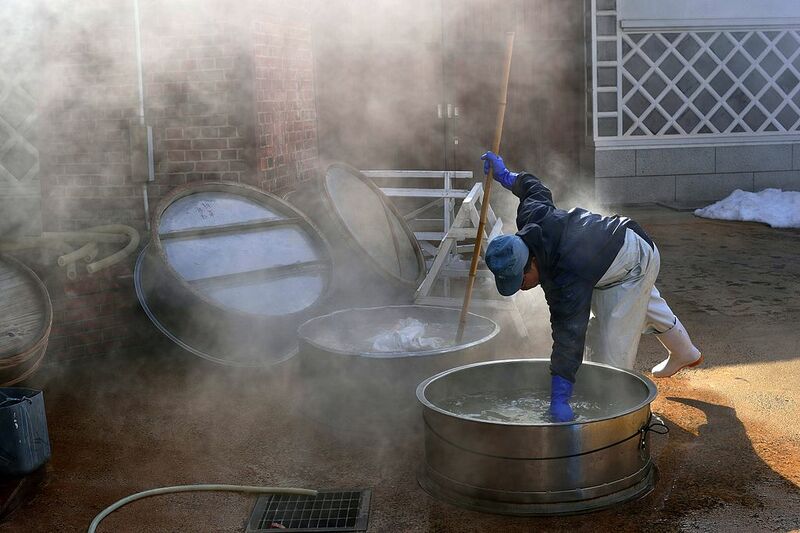 The soupy mash that is formed by this process is now called “moromi”, otherwise known as the main mash. Once all the steamed rice is finally incorporated, it is left to ferment again for another 2 to 3 weeks at temperatures of 15 to 20 degrees Celsius. Other brewmasters make their sake more flavorful by cooling the environment of the sake to 10 degrees Celsius so that it ferments at a slower pace. Once the main mash has fully fermented, it is put through a filtration system. The liquid that is extracted from this is pure, unadulterated sake. Sometimes, brewmasters add a little bit of “brewer’s alcohol”, which is just distilled alcohol to the mix before it is filtered, as this supposedly brings out the flavor of sake more. The sake kasu (the lees from the mash) is removed completely, and the remaining liquid goes through carbon filtration, and then pasteurization. At this point, it is optional to dilute the sake by with the addition of water. It can also be placed in barrels for it to age. 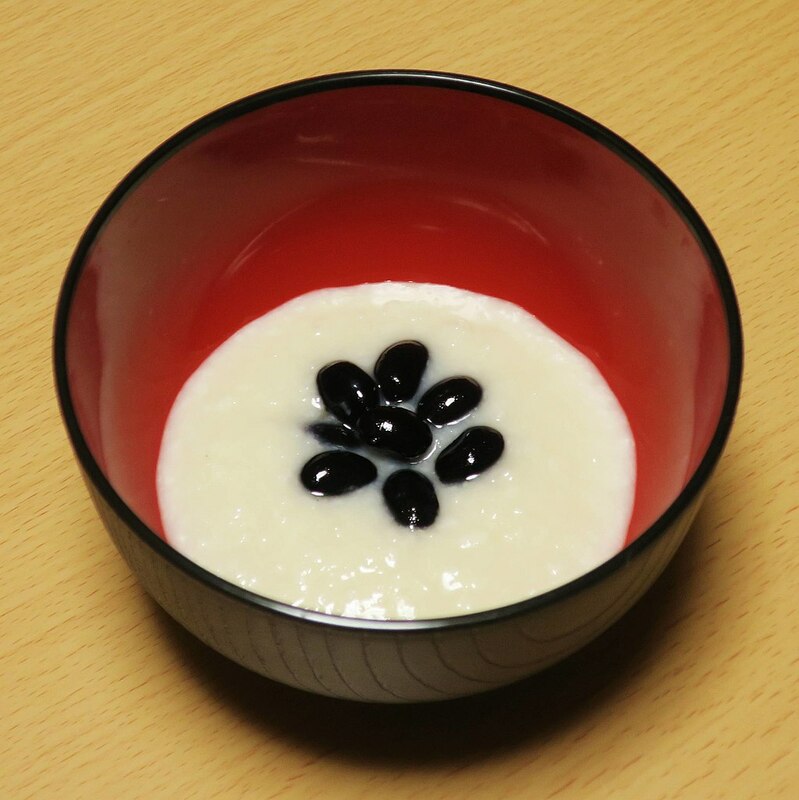 The dry sake kasu that is left behind can later be used to add to soups, desserts (such as amazake which is fermented rice pudding), cheese dishes, and drinks. Sake kasu is filled with good nutrients such as protein and fiber, helping lower LDL and promoting regular bowel movements. Before you partake in homebrewing sake, see first if it is legal to do so where you live. In Japan, it is against the law to brew sake at home, even though it’s been done by people for centuries. Do not expect this process to produce sake that is as good as artisan-made or commercially made ones, as it uses equipment and ingredients that aren’t necessarily the best, but can easily be found. This is a rough-and-tumble way to make sake that does not pay homage to the traditional drink but does the trick in making a form of it. For an audio-visual guide that can aid you (and give you extra tips), try searching for homebrew recipes on Youtube. You can also find a commercially sold “kit” (with instructions and included yeast) to make sake. If you’re comfortable following the instructions step by step, you can go ahead and cleanse each accessory first by boiling everything. This makes sure that no extra bacteria growing on your glasses or jars, as it will interfere with the process of fermentation later on. Once everything is set, begin by cooking 4 cups of (rinsed) glutinous rice. You can do this on a simple pot, or even a rice cooker. Once it is cooked, add the rice to a baking sheet. Next is the yeast - you can buy this at supermarkets. They go by different names, but to make sure, you can let someone of the sales staff in the supermarket know that you’re looking for the mold that makes rice wine, and you will be lead to a product that looks somewhat like a ball of yeast. If you already have them, place them in a bowl, and mash them into fine dust. In a glass jar, add a little bit less of an inch (about 3/4s of one), of rice, followed by a light, evenly placed dash of the yeast. Add ¾ an inch of rice again. Keep doing this until you reach an inch of empty space right before the bottle curves to form the mouth. This space is where the carbon dioxide that will be created by the fermentation will stay. Mix the jar up so that the yeast is more evenly distributed. If you have control over the temperature in any environment at your house, keep this jar at around 12 degrees Celsius to a maximum of 18 degrees Celsius. The cooler the place you put it, the longer it’ll take to ferment. In colder countries, you can leave it on the bottom of a shelf in a cool room, away from sunlight. In one day, the beginnings of sake should start to form. If you’re in a hotter country on a June, better if you find a refrigerator to keep it away from the summer heat. When you taste it, expect it to be a little bit sweet. 2 or 3 days later, it’ll taste more and more like sake. Once it reaches that taste you know to be quite like sake that goes so well with sushi, pour it out and serve it. Home brewed sake, if done properly, makes an excellent brine to cook food, added to desserts, cocktails, and so much more. There is always a risk that is posed when consuming and brewing homemade alcohol. Commercial sake is often pasteurized and filtered properly to destroy any harmful microbes that could be dangerous if ingested by humans. Don’t try to distill any alcohol as that could cause unwanted chemical hazards or even a fire. Brew sake at your own risk. How Do You Make Sake Bombs? Sake bombs are not exactly the best way to enjoy the true essence and characteristics of sake, but it sure is a fun way of drinking it. 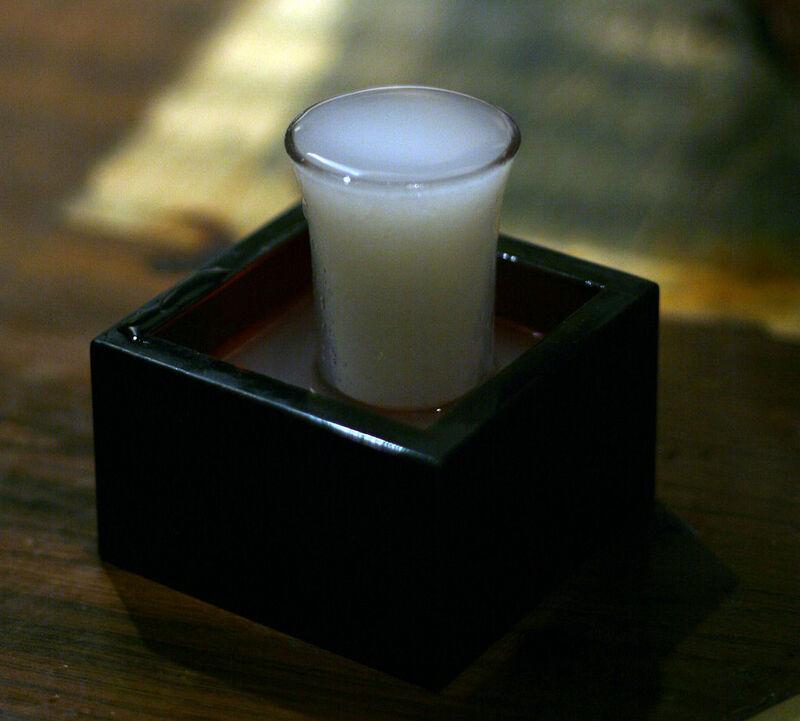 A sake bomb is a simple recipe; it is a combination of sake and beer - but with a fun twist. You can use any beer you’d like, Kirin beer supposedly goes well with sake. Fill up a glass with the Kirin beer; preferably a Collins-type or pint glass. Take a shot glass, pour sake into it (it tastes better if the sake is warm, and measures around 44 ml), and balance it on top of two parallel chopsticks placed on top of the Collins glass. No need to add ice. The objective is to slam the table with your fists in rapid succession until the shot glass falls into the pint glass. While slamming one’s fist on the table, you can either say “Kanpai!” when it falls in, or chant “Ichi ni san” (1, 2, 3) and then slam your fists on the table, and say “sake bomb!” - which is when the shot glass falls in. The sake will cause the beer to fizz a lot, so you have to drink the whole glass.